2019 is the prime time of Vietnam's wood and interior furniture industry, converging the necessary elements to create a breakthrough, becoming a spearhead industry and towards the formation of a wood – interior furniture center of the world in Vietnam. Vietnam’s wooden furniture industry has a wider door with great potential from the two new free trade agreements including the EU-Vietnam FTA (EU-VNFTA) and the Comprehensive and Progressive Agreement for Trans-Pacific Partnership (CPTPP). When implemented, these two agreements will generate relatively major impact on the wood processing industry in Vietnam. In particular, CPTPP will give Vietnam an immediate opportunity to reach deeply into markets such as Canada, Peru and Mexico. And EU with an annual wooden market volume of US$80-90 billion will be a "treasure" when the amount of Vietnam’s wooden furniture penetrating this market is currently less than US$800 million. According to Vietnam Administration of Forestry (VNFOREST), until the end of November 2018, the value of forest product export was estimated at US$8.49 billion, up 16.6% over the same period in 2017; accounting for 23.42% of the total export turnover of the whole industry, of which wood and timber products were estimated at US$7.22 billion, up 15.63% over the same period in 2017. The estimated value of main forest product export for the whole year reached US$9.3 billion. The forest product export market is mainly concentrated in five markets including the U.S., Japan, EU, China and South Korea, accounting for 87.33% of forest product export turnover. Mr. Pham Van Dien, Deputy Director General of VNFOREST said: VPA/FLEGT Agreement (Voluntary Partnership Agreement on the implementation of Forest Law, forest governance and forest product trade signed with EU on October 19, 2018) has given Vietnam a great position when participating in the market and the global timber value chain. Joining the agreement, Vietnam has a more professional, open, transparent and consistent way of doing business with international conventions and standards. This is the factor that constitutes the value of wood industry in the future. Besides, when participating in this agreement, Vietnam also has the opportunity to apply high technology to the wood processing industry, creating more beautiful and higher value wooden products. For example, normal finished wood products only cost US$1,400-1,800/m3, but if high technology is applied, the price will go up to US$4,000/m3 of finished products. Finally, VPA/FLEGT Agreement provides Vietnamese wood industry with a huge market, not being afraid of unsalable goods and worried about being forced to price. It is undeniable that Vietnam furniture industry has advantage as its production cost is almost the lowest in the world, so it has always achieved double-digit growth every year for the past decade. However, it is challenging for Vietnamese goods in general and wooden furniture in particular to access the developed markets such as EU, U.S. and Japan, as they set very high requirements for environmental protection, natural resources and social responsibility. That is why timber products from Vietnam must comply with a lot of demands on legal sources of materials. 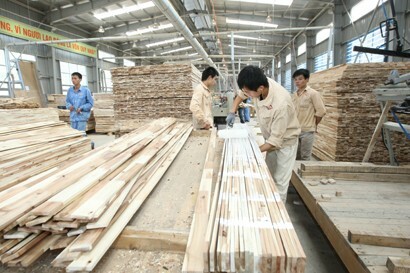 Along with the preparation of businesses, the involvement of the planters themselves, Vietnam also needs to improve the capacity of both producers and processors, and agrees on the principle that anyone participating in the supply chain of wood and timber products will comply with regulations, have legal and transparent actions. Vietnam will build a comprehensive and reliable timber legality assurance system (VNTLAS) to ensure timber imports and legal wooden products through verification systems for domestic and imported timber exploiting and trading in compliance with the law.